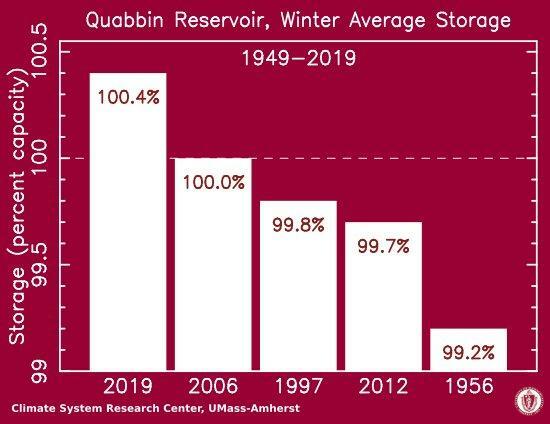 The water level in the Quabbin Reservoir this winter was the highest since the massive drinking water storage site was constructed in 1946. 2018 was the wettest year on record in Massachusetts. The Quabbin Reservoir is at 100.4 percent of capacity – the highest water level since it was built in 1946. Just a few years ago, the worry was about drought conditions in much of Massachusetts. Scientists attribute what they call “weather whiplash” to climate change. With NASA reporting this week that 2018 was the 4th warmest year on record, WAMC’s Pioneer Valley Bureau Chief Paul Tuthill spoke with Michael Rawlins, Associate Director of the Climate System Research Center at UMass Amherst. Ahead of tonight’s State of the Union address, New York Congressman Antonio Delgado of the 19th district has some ideas about how to add to the conversation about addressing climate change. He plans to put forth legislation concerning green jobs in the name of lowering carbon emissions and increasing investment in renewable energy sources. In New York, environmental group Clearwater is launching a climate change curriculum. Author and activist Bill McKibben was in Plattsburgh Monday evening to talk to residents about the status of the environment and the growing urgency to reverse climate change. The drought is over for most of Massachusetts. But, below normal precipitation for several years in southern New England means we are not out of the woods yet. WAMC’s Pioneer Valley Bureau Chief Paul Tuthill spoke today with Michael Rawlins, associate director of the Climate System Research Center at the University of Massachusetts Amherst. With farm fields soaked and basements flooded, this was one of the wettest autumns on record in New England.